Even those with no interest in astronomy will know that Space is dark and full of mystery. 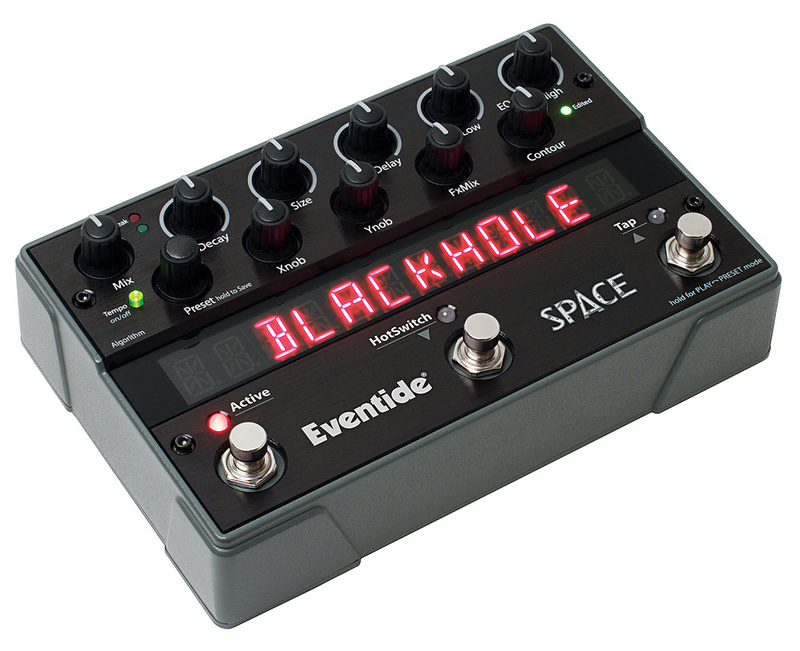 It also happens to be the name of Eventide's latest stomp box, described as "Reverb and Beyond”. This small black box has darkness and mysteries of its own, some of which are lifted from Eventide's own megabucks processors. And don't let the appearance fool you: this innocent-looking pedal is not the exclusive domain of guitarists, whatever they might claim. It has depths that should appeal to the most intrepid cosmic explorers. Compact and rugged, the Space is equally happy on the floor or on your desktop. Weighing in at 1kg and with a solid rubber base, this pedal is ready for a bit of a kicking. Indeed, that tank-like metal case and those sturdy switches would probably come off best in most accidental studio collisions. Thanks to a sombre colour scheme, it's visually different to the rest of Eventide's Stomp Box range. Its display is larger too, running almost the full length of the unit, red letters standing out starkly against the blackness of Space. Patch names can be up to 12 characters, which is helpful when navigating the 100 that are on board. There are so many sockets and connections that they extend beyond the rear and to the right-hand side, the overflow being two rather deeply recessed MIDI ports (In and Out/Thru). Not all my MIDI cables will fit into these, but it's worth rummaging around to find at least one that does: sync'ing Eventide effects to MIDI clock is a delight that shouldn't be missed. In common with its siblings, the Space is comfortable with purely mono operation, or mono input to stereo output, or stereo all the way. The input choices are either guitar or line-level, and there's a decent amount of headroom to cope with all manner of signals, whether from instruments or the effect sends of a mixer. Signal and peak LEDs do what they're supposed to, and power is supplied via a 9V adaptor (batteries are not an option). There's a USB 2 port on hand to transfer software updates and MIDI data, and inputs for an expression pedal and footswitch are fitted. Actually, the latter can handle up to three auxiliary switches when you combine its stereo jack socket with a little ingenuity. A Digitech FS300 or equivalent triple switch should also work nicely. The portal to experimentation with the Space is its panel of 10 knobs and an encoder. Together they select and modify effect patches (referred to as presets). Turning the encoder spins through the presets, but it's a process that feels a little ponderous at times. Presets can alternatively be selected via MIDI or by a switch, so there should be an option to meet most needs. And if 100 seems a lot, the number can be limited. When stepping through them with a footswitch — perhaps after choosing half a dozen prime candidates for a gig — this limit is very welcome. In a departure from previous Stomp Box models' trick of toggling tempo sync by pushing the encoder, the Space has a pushable tempo LED. I re-read that part of the manual before trying it, but the LED is indeed a switch. One push and time-related controls are rendered as divisions of the current tempo. Another push and you're back to working in milliseconds. Neat! The status is stored with each preset, and you can easily spot those that are sync'ed, thanks to the flashing LED. The Space's rear panel features a socket for a 9V external power supply, a USB port, quarter-inch inputs for an expression pedal and aux switch, a switch to toggle between amp and line-level output, stereo output and input sockets (again on quarter-inch jacks), and a switch to set the input between guitar and line level. MIDI In and Out sockets can be found on the unit's right-hand side. There are two modes of operation: Preset and Play. You toggle between them by pressing and holding the right-hand switch. In either mode, the left-hand switch offers an effect bypass — it even sports a true analogue bypass that eliminates the active circuitry between inputs and outputs. Personally, I opted for the 'DSP & FX' version of bypass. With that enabled, a click of the left switch allows reverb tails to continue smoothly fading into the distance while you play cleanly over the top. Far nicer. Preset mode is about quickly selecting patches using the middle and right-hand switches. In this mode, the first press of Bypass acts as 'enter' to confirm preset selection. Preset names are temporarily reduced to 10 characters, with the preset's number replacing those that are lopped off. The second mode is Play Mode, in which the middle switch becomes the 'Hot Switch' and the right-hand switch Tap Tempo. Tap Tempo is obvious enough but the Hot Switch deserves explanation: its job is to give a completely new complexion to any preset. To program this switch, simply press and hold it, while adjusting any of the knobs. Now when you press the switch, it shifts to the updated values — instant variation! If you relish extra control, an expression pedal is a must. Again, it's a doddle to set up: push the pedal all the way back and adjust a few knobs, then push it forward and adjust them some more. Voilà, the pedal now morphs the values. Depending on the parameters chosen, the results can be wildly transformational; you can morph every single knob — in different amounts and directions — for crazily complex changes. Speaking of which, anyone with a modular synth will be interested to know that the Expression pedal input accepts signals of 0-3V. Having used other Stomp Boxes in the range, there's one control I prefer to remain live rather than be recalled from presets — it's the one whose function never changes: Mix. Fortunately, with just a quick dip into the Global Menu, the Space can be told to ignore stored Mix values. A simultaneous push of the encoder and right-hand switch reveals this and other settings that aren't directly performance-related. It's fair to say that for some of the menu surfing (the extensive MIDI tailoring, for example), it's hard to avoid reaching for the manual. This explains the knobs' 'passthru' mode, the transmission and reception of MIDI continuous controllers, and much more. However, these typically aren't changes you'll make very often, if at all. The Space is housed in a seriously robust metal case measuring 122 x 190 x 54 mm. Space, as Douglas Adams once wrote, is big. To grasp its enormity requires an appreciation of the 12 underlying effect algorithms, some of which can trace their origins to machines such as Eventide's H8000 or Eclipse. The first 12 factory presets correspond neatly to these algorithms and are: Hall, Room, Plate, Spring, Dualverb, Reverse, ModEchoVerb, Black Hole, MangledVerb, TremeloVerb, DynaVerb and Shimmer. As each algorithm becomes live, the knobs' roles are reallocated. Despite Eventide being as consistent as possible with the panel labelling, it sometimes takes an experimental tweak to discover exactly what the knobs do. The Preset Guide includes comments from the preset creators, a pedigree team of studio gurus and producers. Not that you'll need a guide to hear that the standard is very high. If you're worried about overwriting anything, there's no need: the presets can be restored at any time. Having said that, I suspect that once you start exploring and personalising, you won't go back. Starting gently, there is a selection of bread-and-butter reverb algorithms. Hall features decay and pre-delay (both tempo-syncable) but is made special by the tweakability of well-chosen controls. These blend low, mid and high reverbs and random modulations to summon a wealth of warm and wonderful or dark and brooding spaces. The Room algorithm is ideal for casting subtle magic, whether over vocals, acoustic guitars or entire mixes. A great example is found in the factory preset 'Just Cuz', with reverb tone and diffusion under jurisdiction of the Hot Switch and expression pedal. If you appreciate early mechanical reverbs, Plate will be right up your street; it yields anything from subtle room tones to vast oil tankers, as demonstrated by the cavernous 'Oil Drum' preset. For a different metallic flavour, the Spring algorithm is inspired by the spring reverb of guitar amps. You can alter the number of springs and their tension, plus — for further retro glory — there's a built-in tremolo. In the preset 'Spring Theory', the pedal tightens the springs from short and metallic to loose and boingy. We start to move into more complex areas with Dualverb, two separate reverbs with independent decay, size, pre-delay and tone. Then there's Reverse, which lines up reverse and forward reverbs, plus delay. Anyone into psychedelic guitar solos should enjoy dialling up the cascading patch 'Continuum'. Next is ModEchoVerb. Based on the H8000, its effects are scalable right up to canyon-size. With its infinite decay and swept reverb, flanging or chorus, this is a monstrously powerful algorithm as evidenced in the 'Echospace of God' preset, steeped in celestial, reverberant mush! Probably my favourite algorithm of all is BlackHole, thanks to its trippy Inverse Gravity with resonance and a feedback that's piped around the entire reverb structure! Some wicked patch examples include 'Dark Matter', conjuring up huge, Lustmord-scale chasms. Or 'Nebula', in which the Hot Switch activates infinite decay, with nebular expansion controlled by a squeeze of the pedal. The universe gets a tad seedier with MangledVerb. Taken from Eventide's Eclipse, this is the punk of the collection, feeding reverb into distortion to produce a versatile, if scary, reverb. Then, for rhythmic chopping, there's TremeloVerb with its selection of syncable LFO shapes — illustrated nicely in the Sample and Hold of 'Broken Glitch'. This preset is perfect for munching incoming audio, breaking up loops, rhythm guitar, and so on. We're nearly at the end with Dynaverb, an adaptable dynamics reverb based on the Eclipse and Omnipressor. This shapes the output according to the input signal, the reverb's own signal — or any blend of both. Expansion, compression and many zany or inverted dynamic effects emanate from here. The preset 'Phil Mcavity' suggests a rather well-known gated reverb, crying out for a tom roll, and maybe a gorilla. Last, but not least, there's Shimmer. This includes a healthy splash of Eventide's famed pitch-shifting. With shifts of up to two octaves in either direction plus delay, reverb and feedback, Shimmer is the source of the freakiest, most banshee-wailing strangeness ever to grace a stomp box. Notable presets based on this algorithm include 'Size Matters', a long, huge, shimmering affair with pitch-shifting via the Hot Switch. It transports you out of this world — and then out of several others too! I must also mention 'Nero's Ascent', a rising, tense preset that's perfect for pads, sound design and atmospherics. I could go on, but you probably get the flavour. The presets are rich and varied, ably showing off the Space's scope and hinting at its performance potential. All the algorithms offer something of value, and many transcend pure reverb with the inclusion of delay, modulation, pitch shifting or distortion. I'm a fan of Eventide stomp boxes, and I see the Space as the icing on an already rich and creamy cake. It's obviously conceived with the guitar in mind, but there's absolutely no reason why guitarists should have all the fun. These stomp boxes work equally well on synths, vocals, percussion — you name it. Admittedly, it occasionally feels wrong to place effects of this class on my furry, weed-ridden carpet rather than in a flightcase or pristine studio rack. And, compared to most guitar pedals, the Space may appear expensive. But if you possess a couple of fully functioning ears, that impression is easily dispelled. The Space's reverbs are deliciously usable, but it's in the more outlandish and adventurous algorithms that its full character shines. 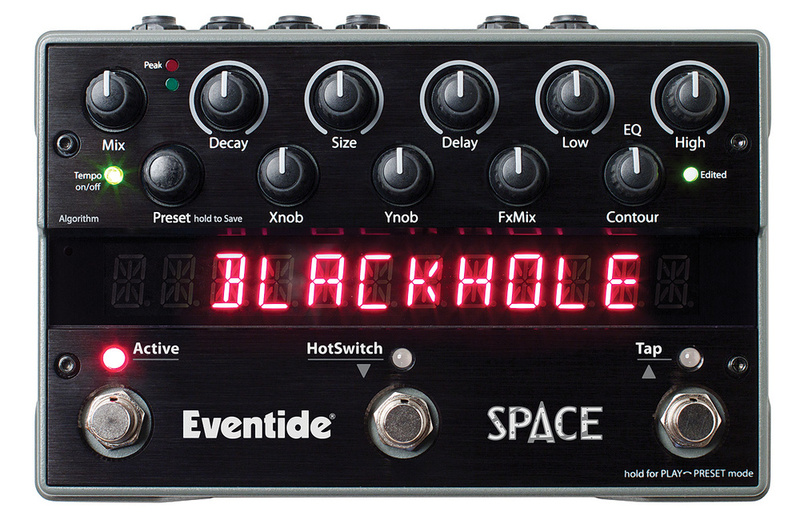 In combining reverbs of this class with delay, pitch-shifting, tremolo and more, Eventide's black box has a capacity for 'plush weirdness' rarely found (and almost never in effects processors I can afford!). With just the right degree of 'hands-on', an extensive MIDI spec and a great set of factory patches, there's little chance the wonders of Space will be unappreciated for long. Indeed, I've ordered one myself! A well thought-out, often inspirational effects unit. Expressive, tweakable, controllable and compact. An affordable Eventide reverb — and beyond. Exposure to Space could give you GAS. Some knob functions are not immediately obvious from the panel. 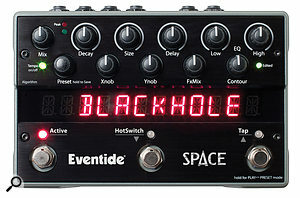 Eventide have once again managed to cram many fine qualities from their studio processors into an affordable stomp box. Irresistible. Eventide +1 201 641 1200.